As Winter draws nearer it brings shorter days, darker nights and one of the most special times of the year - Christmas. A sacred and religious holiday for many, Christmas celebrates the birth of Jesus Christ, and although its origins are firmly linked to this special occasion, for many children the world over, Christmas is a magical time filled with surprises and the excitement of Christmas morning. With coffee brewing, parents watch sleepily on Christmas morning as their children gleefully open their gifts. Shiny paper, ribbons and carefully written gift tags are scattered around with abandon as the children tear into their Christmas gifts. Squeals of delight fill the room as children discover their wishes did not go unheard and Santa gave them just what they wanted. But for many adults though, Christmas starts much earlier than the morning of December 25th, it usually begins somewhere between Hallowe’en and Thanks Giving. With the front door displaying fresh balsam Christmas Greens which take the form of a Decorative Wreath to the outdoor Christmas lights that adorn the trees and shrubs... Christmas is coming. As the stores gear up for the retail Christmas season, there’s more to consider than just the gifts for family, friends and children. These days the poinsettia is a hugely popular plant and adorns many a table at Christmas. In fact Poinsettias have become the most popular flowering plant sold in North America at Christmas time. Once thought to be poisonous, this Christmas favourite is one of the most memorable images of Christmas. See our wonderful selection of vibrant Red Poinsettias and White Poinsettias. And although Christmas comes but once a year, if you want your family and friends to get their gifts in time, you need to plan ahead. Sending presents through parcel mail is definitely an option, however verified hand delivery of a custom created Christmas gift basket provides both peace of mind to the sender and for many is the Christmas gift of choice. Available in all shapes, sizes and configurations. If a gift basket wasn't what you had in mind you could consider sending Christmas Flowers or a Christmas Plant. Unless you operate a retail store, Christmas brings a slower pace and time for reflection as the end of the year approaches. Booking time with family and friends, dinner parties, socials and other events fill our thoughts. Of course you'll want to ensure your gatherings around the Christmas dinner table are the talk of the town because of your exquisite Christmas Centerpiece. Why not consider decorating the rest of your home for the festive season with a nice Holiday Planter or beautiful Christmas Cactus. But lets not forget the people we work with, the clients we serve. Christmas is a great time to recognize their part in your success and good fortune. Sending Christmas corporate gifts is now acceptable and many companies send out cards. Of course you need to be mindful of the gift, the recipient and any special limits that may exists - for instance some companies do not allow their staff to accept gifts over a certain dollar value. 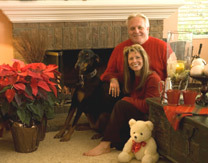 However, that being said, hand delivered poinsettias or appropriate Christmas gift bouquets, Christmas floral arrangement or even a simple basket of Christmas flowers, or perhaps a Corporate Christmas Gift Basket or a Chocolate Gift Basket is an excellent way of saying that you appreciate their support and wish them a very Merry Christmas.